Recover PST file Contacts after getting Corruption issues. Provide best options to convert PST and OST Contacts into PST, VCF, CSV file formats. This feature permits you to frequently convert address book files of MS Outlook and Exchange to both format of PST file. ANSI that support PST file of size 2 GB, as well as UNICODE that support PST file up to 20 GB even you can extent limit in it to some extent. Outlook contacts VCF converter allows users to convert address book files of MS Outlook and Exchange to VCF (virtual contact file). 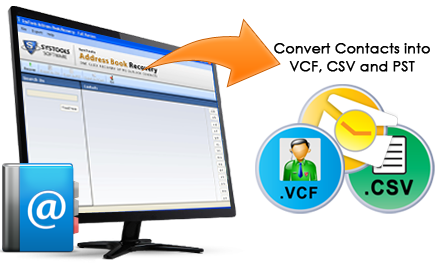 As by converting Address Book contacts to VCF format you can used VCF file on Windows, Mac Operating system as well as it can directly uploaded on IPhone mobile of user. Software allows users to convert address book files of MS Outlook and Exchange to CSV file. A CSV is a most simple file format widely supported by business and scientific application. CSV format works as most of the program support it as alternative import/export format. It is data retention ability renders PST contacts assurance details being conserved unblemished throughout the procedure. In other words you can say that Address Book Recovery software provides completely safe and advance recovery process in a flawless manner. Address Book Repair Software offers easy, simple and new GUI (graphical user interface) so that both technically and non-technically person can recover/ restore/repair their address book contacts of MS Outlook and Exchange in differ file format like VCF, CSV and PST without putting an addition effort. It works smoothly with all available versions of windows like: 98/Vista/NT XP/2003/Win7 and Win 8 (both x32 and x64). MS Exchange versions as 5.0/5.5 2000/2003/2007 & 2010 or 2013 and Microsoft Outlook like as 97, 98, 2000, 2003, 2007, 2010 and 2013 (both 32-bit and 64-bit). Obtain Address Book Contacts Recovery software for recovering of corrupt, lost or damaged address book of MS Outlook. While working with computer system, we used to have email accounts and maintain address book to store important emails, information, contacts of vital clients, friends. Using emails one can exchange information quickly. Email Systems fills the gap between the two persons or groups of different place. MS Outlook and Exchange are the most popular email clients. However, these email clients may get corrupt creating serious problems. As email clients get corrupt, contacts or address book of those email clients get inaccessible which affect your business very badly, your whole business transaction can get stuck. Address Book Recovery application is the most reliable contacts recovery program, which helps you to recover lost contacts from corrupt or damaged Address Book of MS Outlook, Outlook Express and MS Exchange Server (.OST). MS Outlook Contact file converter. Address Book Recovery program perfectly Recover Contacts from Outlook (.PST file)(Personal Storage file) without affecting original data. What are benefits of Address Book Recovery Software? Address Book recovery software is chiefly intended for recovering of deleted or lost contacts information from damaged address book. This tool will allows you to automatically regain lost contact details and its shows preview of recovered contacts in alphabetical form. Demo version of Address Book Recovery Software, how many PST files can I recover? With the help of free trial version of Outlook contacts VCF converter software allows you to recover 15 PST/OST contacts per folder. After getting done recovery process, user can easily view preview of recovered contacts. Can I Convert Contacts into Different Formats? Yes, you can easily convert your contacts into PST, VCF, CSV file formats without facing troubles. How can I see the location of Recovered Outlook Contacts after getting Recovery Process done? Outlook contact files converter provides you opportunity to save all contacts into desired location. It gives you a pop-up screen, where you decide the location of contacts where you want to save, after getting recovery process completed.